I loved straws when I was a kid. At a minimum I had to have a bendy straw. Those boring straight straws were only good for connecting together into a giant straw so that you could drink your milk from the floor. My favorite straw was always the crazy straw. I never drank very quickly with them. I spent most of the time just watching the milk slowly twist its way through all of the curves. Perhaps a meatloaf shake would work? Some cream or vanilla ice cream could do wonders. i was trying to get first post but oh well second works. I still connect my straws (Im still young so yeah) but not very often. I don’t like how you can buy a regular straw from the store but cannot connect those to your soft drinks you but at the mall. And Anon. this is how i connect my straws. All i do is pinch the tip end of the straw to make a V shape then i just make it longer by running my fingers. After that i insert it into another straw end and release there you go a super long straw ^_^. Those crazy straws never really grew on me. Its probably because i usually can’t drink enough because i ran out of breath, but it was fun when me and my friends raced each other with our straws to see who can drink the fastest. Biff needs to get himself one of those slushie straws. They are alot wider. yeah, that floormilk was always the best. I’m not a huge fan of straws, probably because I am not a big fan of zombies and straws are very zobiesque with their draining of fluids and such. One thing i do like about straws is where you wind them up and then have somebody flick the pocket of trapped air. That sound is the best, and I’ve found that the black straws you get from more middle-fancy places make the best noise. haha, i thought the crazy straws didnt work too well.. then i got a good one. boooooy did my thoughts change!! I think the only good thing about those straight straws is blowing the wrapper at people. That’s fun. I once joined about four crazy straws together, had the entire glass of whatever it was in the straws at once. I used to have fun with those zany straws myself (yes, I said zany). Sometimes, I wouldn’t even let my drink get to the top of the straw, I’d just stop inhaling and watch the fluid reverse itself through the straw. Oh, the days of youth. DUDE! I just had meatloaf last night! Biff should try going to Mcdonald’s and grabbing a few. Those things are wider than any other I’ve ever seen. ya crazy straws are great. i seen one of them cups that got the straw that winds around it. it would take like a minute for yo to actually get the drink in ur mouth, the straw looks like it would be 4 feet long if u straightened it out. Hi! I found Biff by clicking an Ad at Bob and George. I just finished reading through the archive. 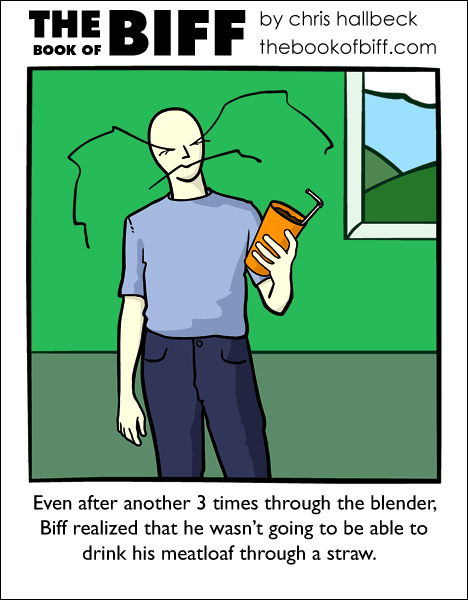 I think Biff is a hilariously funny webcomic, and I enjoyed being able to read through the whole archive quick, since each comic is only 1 panel long. I usually don’t comment but i just had to on this one cause i used to love crazy straws. I alwasy thought the best cups were the one with the crazy straws attatched to them! then you never lost your straw. unfortunately my mom thought they were a waste of money and the only one i had was lost when we moved a long time ago…. Biff could possibly use a modified length of hose and freeze it (as it would harden), then call it a straw. He should try mixing it with some beef broth next time. A microwaveable beef pot pie and a cup to two cups of beef broth was better though. You know you’d be surprised what you could turn into a drink when you have a broken jaw. I had turkey when my jaw was broken. haha, me and my troubled youth. Do people still roll up their straws n flick em til they pop ? I’m happy to have drinks at the other end of my straws. I have always said that there needs to be more meat based drinks. A friend of mine actually tried that. He wanted to take his meatloaf in a thermos for lunch. It actually worked, and he said it tasted all right. Of course, he spent an hour making it. Huh…I used to put my straight straws into one giant straw…Those were the days. When the family came over, i could use my super long straw to drink somebody else’s drink from across the table. I went into Wal-Mart around midnight the other night and looked all over for crazy straws to no avail. Then I asked someone where they were, and after they glared at me for a solid minute, they tried to sell me BENDY straws. Awesome, but not the same. I don’t care how cheap Wal-Mart is. I was disappointed. I always wanted a crazy straw that was so long, it could hold the entire content of an 8oz can of soda. bubble tea straws are great….they are HUGE. I’ve been considering using a blender to get the ground beef to the right consistancy for doner kebabs (a type of meat loaf sliced and served in a pita, aka donairs). Meat Loaf. It is a loaf of meat. Huh. Imagine that. Meatloaf is a meat dish consisting of seasoned ground meat (usually ground beef or a combination of ground beef with veal, lamb, or pork), which is formed into a loaf shape and baked or smoked. He should use his powerful vacuum, but modify it so he can drink. That would fix his problem.